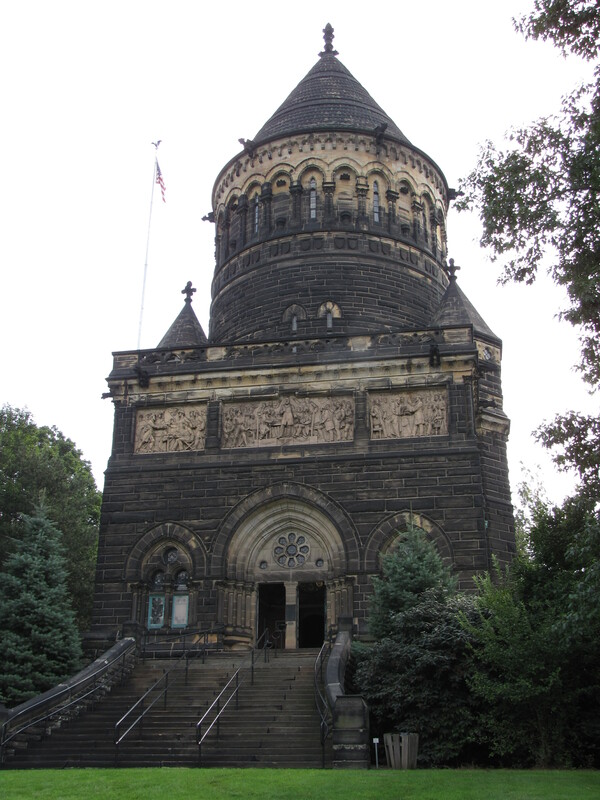 The tomb, in the Lake View Cemetery was designed by George H. Keller, is a circular tower 50 feet in diameter soaring 180 feet high made of Ohio sandstone. 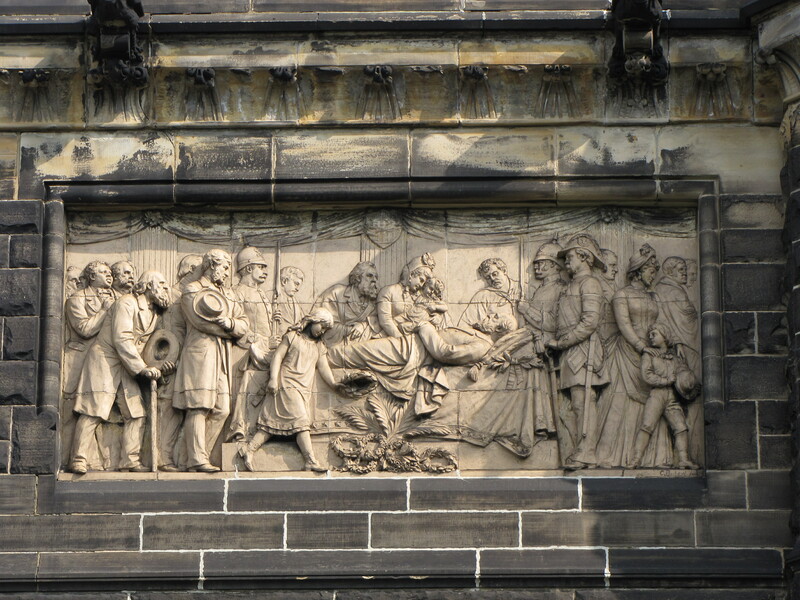 Wrapped around the “porch” of the monument are five bas-relief panels that depict scenes in Garfield’s life and the last of the five illustrating his death. James Garfield, the 20th President of the United States, was the last person who came from log-cabin beginnings to be elected to the highest office in the land. Garfield was born in the Ohio countryside on a farm. At less than two years old, his father died and the family struggled to get by living in abject poverty. By hard work and determination, Garfield rose to the presidency. As a teenager, Garfield took a job working on the Erie Canal on a construction crew but was determined to gain an education. He turned out to be a gifted learner and was hired at Hiram College to teach where he had been a student. Garfield was elected as an Ohio State Senator, nine-time United States Congressman from Ohio, and served as a General in the Union Army during the Civil War. After the war in Congress, Garfield was a tireless supporter of freed slaves and political reform railing against the political spoils system. Garfield was a skilled and compelling orator. In 1880, at the Republican National Convention he was asked to give a nomination speech for the Secretary of the Treasury, John Sherman, who was running for the presidency. His spellbinding speech so moved the conventioneers that Garfield himself was nominated on the 35th ballot. Only four months into Garfield’s presidency, Charles Guiteau, a dissatisfied office seeker and lunatic, shot the president twice once in the arm and once in the back. For the following 80 days Dr. D. Willard Bliss directed the care of the wounded Garfield. But it was not the assassin’s bullets that killed the felled president, but the inept care he received. Bliss believed that the antiseptic and sterilized operating conditions that Joseph Lister wrote about was quackery. In fact, Garfield’s bullet wound was searched by the bare and unwashed hands nine times without antiseptic on the day he was shot which led to the infections that riddled and weakened his body. A new book, Destiny of the Republic: A Tale of Madness, Medicine and the Murder of a President, by Candice Millard details the apalling medical care that President Garfield received before his death. 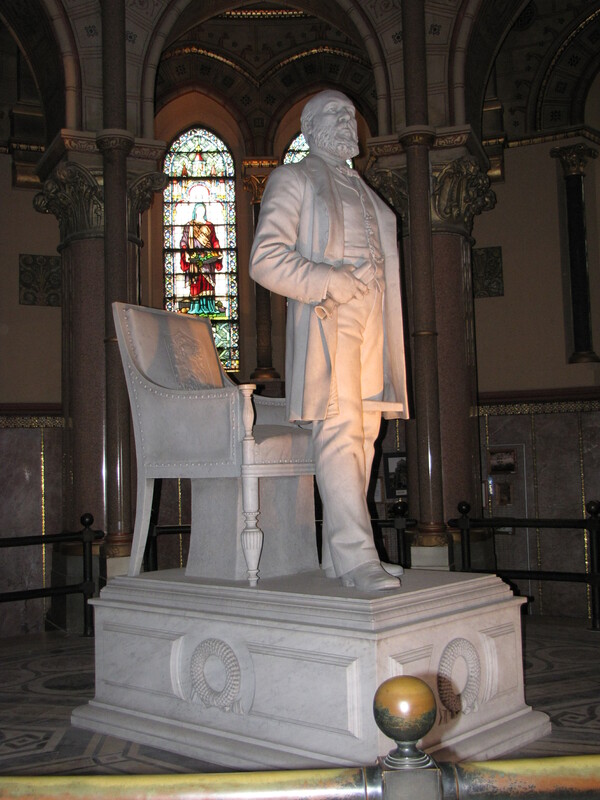 This white Carrara marble sculpture by Alexander Doyle captures James Garfield just as he stood beside a chair to deliver a speech in Congress. 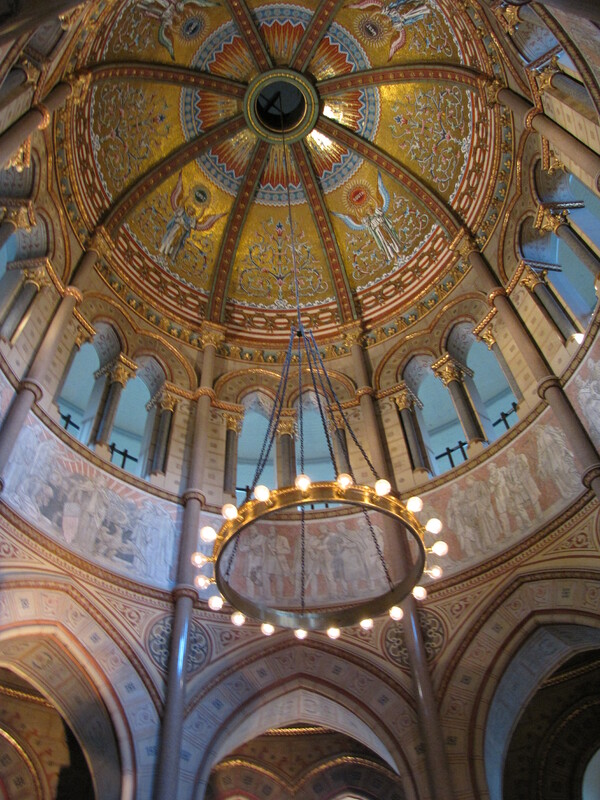 The dome of the Garfield Monument depicts angels from the four corners—North, South, East, and West–of America mourning the loss of the President. Below the great hall with the statue of Garfield is the crypt that displays Garfield’s bronze flag-draped coffin next to Lucretia’s casket. 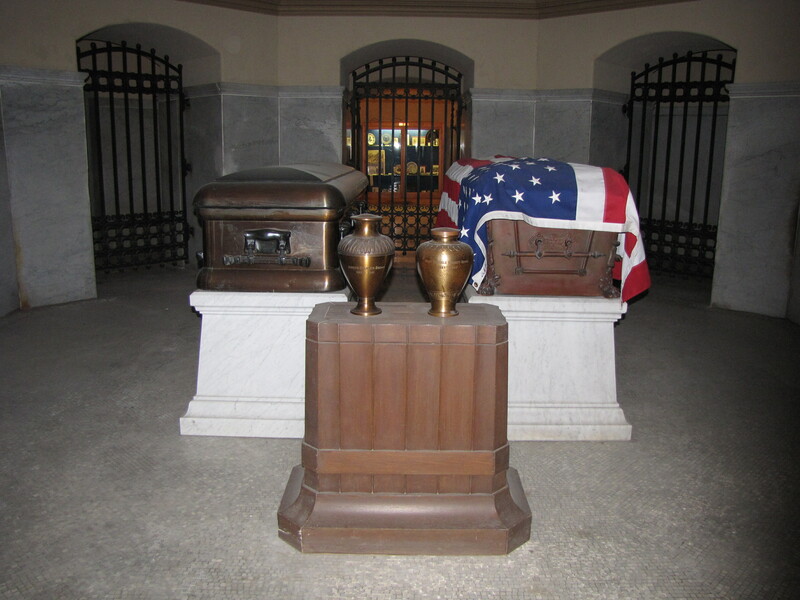 Two urns are placed in the crypt—that hold the remains of Mollie Garfield Stanley-Brown, their daughter, and her husband, and former devoted secretary to President Garfield. What an impressive monument! Thanks fir the great pics and brief history. OK, I’m all in on reading Destiny of the Republic. Thanks for posting this one. Thank you for telling about the medical care that Garfield received. It is easy to forget how far medicine has advanced. The monument is stunning – beautiful pictures! I just finished reading a diminutive biography of Garfield, someone who I knew nothing about. Then I got curious what his grave looked like . . . . and that brought me here. Wowzers, this is an amazing monument for such a forgotten man. Who knows about this monument outside of the folks in Cleveland?! Now I want to go to there. Thanks for posting this article!